Six high school seniors celebrating with day's excursion find themselves on rowboat attacked by man-eating fish and must decide who must be sacrificed as they fight their way back to shore. This marks the third time Milan Records works with Fall On Your Sword, following Another Earth. 5/5 I found this score to be a little creepy, just like wading in water... waiting for the attack. Did we get a attack, you better believe it. Some down home cooking styled music that starts to change from quiet boat ride to, hey look over there. 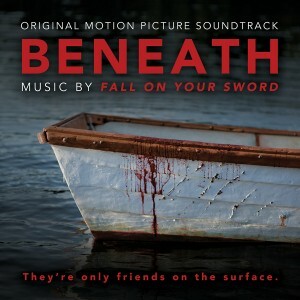 I am finding I am truly enjoying this artist "Fall On Your Sword". they have had some great releases over the last couple of months... You will be hooked! Nothing fishy here, wait... I got to know more about this film.